This historic Mission Dolores house was deserving of much more than a conventional remodel. In order to preserve the charm of the neighborhood, San Francisco city regulations had precluded doing any major alterations to the front of the house. Our client was after a very lush, gardenesque statement for the façade of the residence. The lower entry courtyard provided the perfect canvas for a lively and colorful vertical garden. The north facing wall receives the ideal ambient light for an informal mix of shade loving ferns, maples, and gingko trees. Modernist planters extend the vertical line of the courtyard railing, while enclosing the intimate garden courtyard. Matching cubist planters provide a staggered arrangement of green spheres up the rarely used staircase to the master suite of the property. 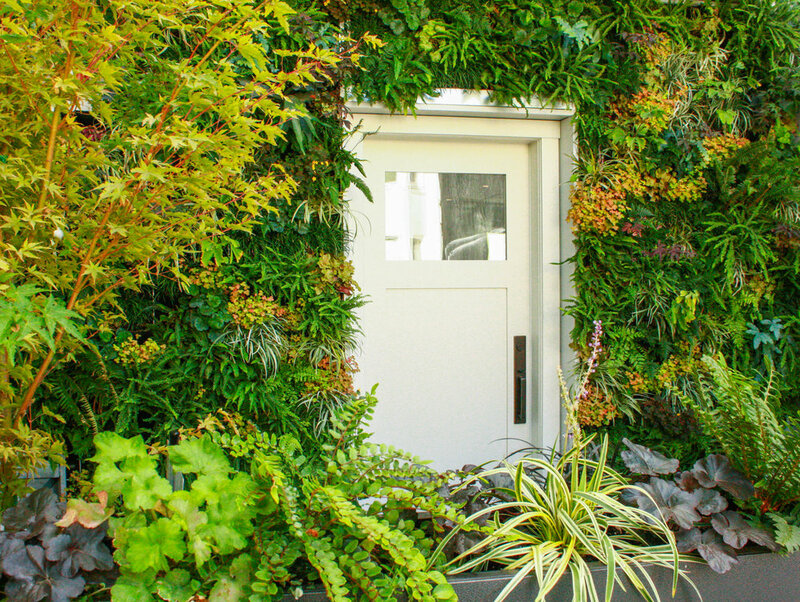 As with all vertical gardens, this lush wall is automatically irrigated and requires just a quarterly maintenance call to prune/groom the plant material.